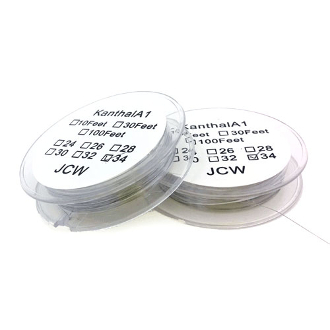 This is high quality Kanthal A1 wire used to rebuild your coils for atomizers/clearomizers. It can withstand heat up to 1300°C-1500°C or 2372°F-2732°F. This standard, round wire is available in several diameters/gauges to accommodate the OHMs and voltage needed for various atomizers/clearomizers. Kanthal is an alloy composed mainly of Iron, Chromium and Aluminum. Known for its clean taste and being a stronger wire than most, A-1 kanthal wires are perfect for rebuilding your atomizers.